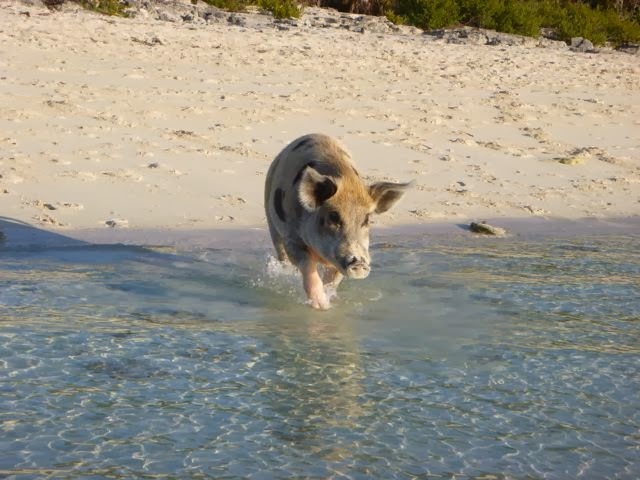 Galley Wench Tales: Hog Chase! 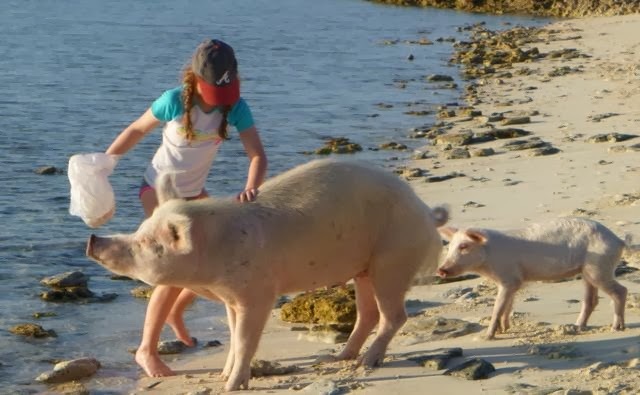 Last year, more pigs, more were swimming. Imagine swimming pool aqua waters, 400 pound sows nearly sinking our tiny dinghy in their eagerness to snarf Jerry Garcia pancakes. Well, you don't have to imagine it.... here's photographic evidence! 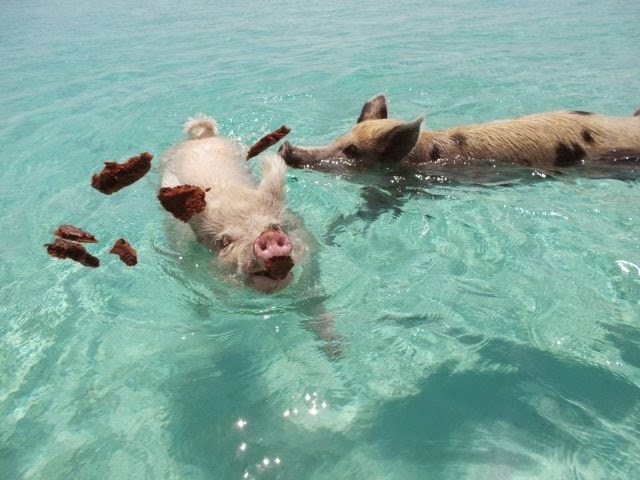 (Click here to see the rest of last year's spectacular images -- my Facebook banner still bears a swimming pigs images from last May). This year, with our bigger, faster, higher riding dinghy (thank you West Marine!) we were far less worried about capsizing. 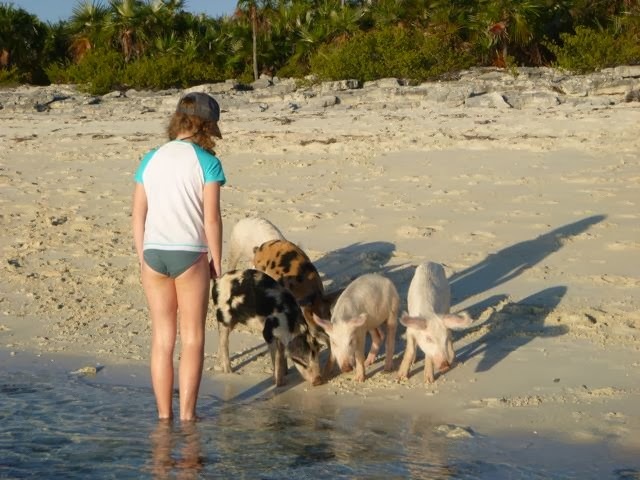 There were also less pigs. Maybe feeding time wanes as sunset approaches. For good reason, as we fed the pigs, we were food for the no-see-ums! We fled to our dinghy, slapping, waving and scratching, and enjoyed watching the feeding from afar from the next set of visitors. 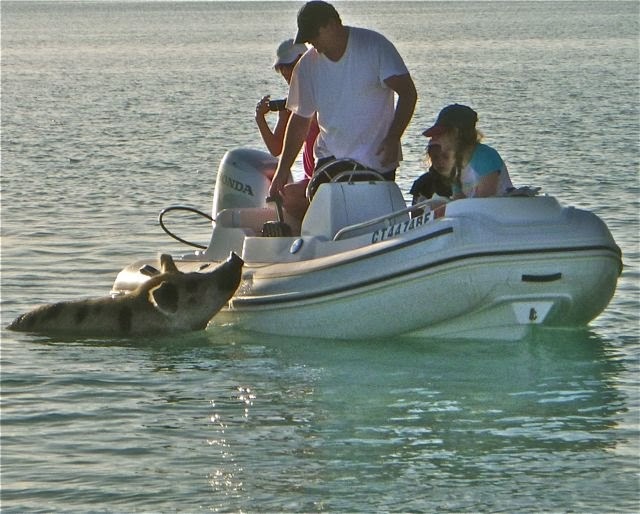 As we motored out into Great Major Cay bay at sunset, we salivated over the scent bacon, wafting lazily across the still water. We're betting some cruiser was inspired by the sight and it's just a coincidence there were less pigs this year than last. is bigger than you'd think! Feb 20, 2014. BAHAMAS. Black Point, Great Guana Cay, Exumas (N24.10.937 W.76.24.291). Tomorrow, we'll be anchored at a TBD isolated harbor further South on Great Guana Cay (no internet). 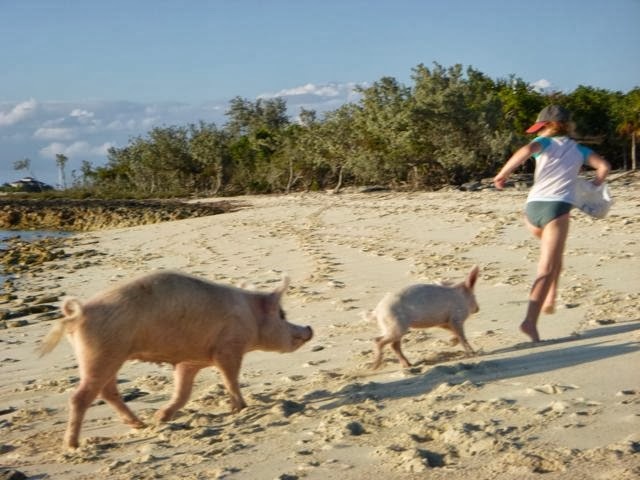 Part one: Look at the cute piglets! Part two: Feeding the sow and piglet. Big sow! Part three: Food gone. Run away! Run away!